Do you enjoy exercise for seniors? When older people lose their ability to do things they like to do, it usually doesn't happen just because they are aged. It's because they're not active. Here is the good news for older adults: the ‘natural’ signs of aging- decreased muscle mass, painful and stiff joints, decreased mobility, and poor balance, can be delayed until you are 80 and beyond. There are four main types of fitness exercises-Endurance, Strength, Flexibility, and Balance. They help seniors and older adults stay healthy and independent, so they can continue doing things they like to do. I will illustrate them by referring to some of my own pastimes and interests. These activities get my heart pumping and may even have me feeling a little short of breath. They include hill walking, hiking, swimming, and cycling. As well as maintaining heart health and circulation, endurance activities lessen fatigue on daily activities such as gardening, house cleaning, stair climbing, and hobbies such as golfing. I have a personal trainer who tells me that Weight Training is the ‘Fountain of Youth’ exercise for seniors! I like the gym in winter time and on rainy days. The trainer keeps me motivated in pursuit of my goals, and the weight machines provide a wide variety of exercises. I also take pride in working in the same environment as fit and strong men and women, and being able hold my own with some of the thirty-something set! Muscle mass decreases as we age. Muscle keeps us strong, burns calories, helps us maintain our weight, and it contributes to balance and bone strength- both important in staying active and limiting the risk of falling. The good news is that muscle mass can increase at any age in response to exercise. Building strength helps maintain independence carrying out daily activities like opening jars, lifting objects, and putting out the trash. Muscles are your best defense against ageing and body fat. It is important to keep muscles and joints supple so we are less prone to injury. Hill Walking is ideal exercise for seniors and is one of my favorite active retirement hobbies. In this activity I am at various times walking on soggy black peat, jumping over streams, scrambling up walls of slippery peat, running across oozing mud, treading gingerly on gravelly paths, unstable shale, broken branches, and brushing through heather. Stretching exercises are essential to keep flexible and give me more freedom of movement, which allows me be more active for longer during my senior years. Balance exercises to avoid the disabilities that could result from falling are vital to our quality of life as we age. We need to be confident in standing and moving. Building leg muscle will be helpful for this objective. Yoga is my principal activity for enhancing balance. Finding an exercise program that works for you and sticking with it is one of the healthiest things you can do. Work with a qualified coach, a personal trainer would be ideal. Supervised training ensures that you are using the correct form for best results. I use the Educogym system. No matter what your age, proper form and technique are key to avoiding injury. Get medical clearance from your doctor before starting an exercise for seniors program, especially if you have a preexisting condition. 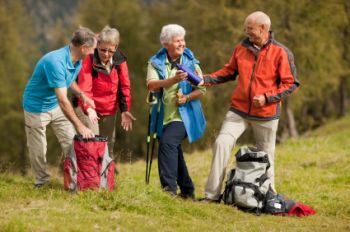 Are you a physically active senior? Are you fit enough already? Tell us what you do to stay healthy and young at heart. There are many health benefits to scuba diving. If you are moderately active, scuba diving as a retirement hobby, is an excellent low-impact aerobic activity.